The Miami Heat signed forward Josh McRoberts in the offseason, hoping his shooting, passing, and defence would be a nice complement to their Big 3. With LeBron James gone, it would seem that McRoberts would have an even bigger role than originally intended. Instead, McRoberts has only played 19 minutes through two games, averaging 2.5 points and 2 rebounds per game. Maybe the struggles would explain his random freakout on the court after failing to grab a rebound? 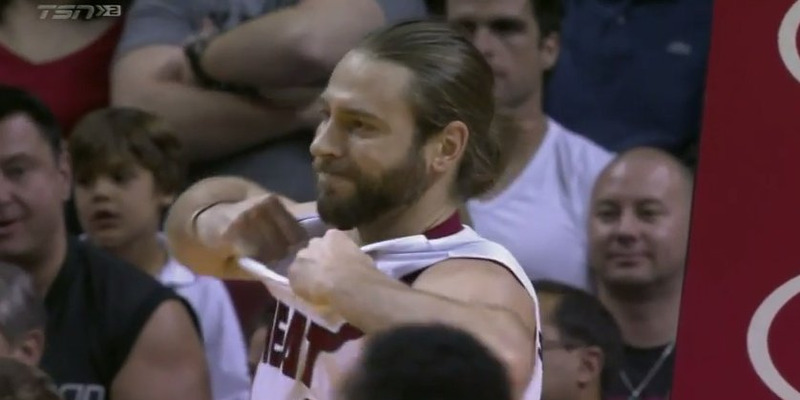 McRoberts would have to leave the game because of the wardrobe malfunction and then go back to the locker room to get a new jersey. It’s not the first time a player has had such a temper tantrum. Notable draft bust Darko Milicic once ripped his jersey, too. Hopefully McRoberts cooled down after the game. The Miami Heat beat the Toronto Raptors 107-102, making Miami the only undefeated team in the Eastern Conference.